Home Brew - Kansas City Style! 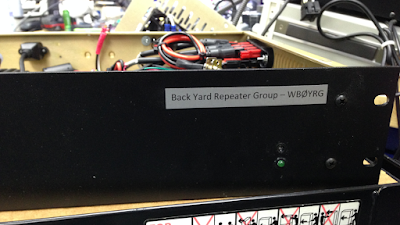 We here at BYRG World Headquarters have been experimenting in taking some of our older analog-only radios and using some behind the scenes "Sm0ke and Mirrors" secret sauce to make a very versatile DMR compatible digital radio repeaters. MCS2000 VRM-650 UHF Transmitter & Receiver decks. Controller with the DMR-UTAH Pi image for software. We feel that this is a better way to go than the standard MMDVM Ubuntu Mate software load. D-Star & P25 as well as DMR if we want. More to come on this VRM-650 DMR project as I get it completed and tested. In Part #3 we will cover the conversion and hook-up of the MCS-2000 VRM-650 radio deck to use for the RF portion of the DMR repeater project. This RF deck requires little overall modding and is pretty much a painless way to go without worrying about matching heads and cables that you might find with regular MCS-2000 radio packages. It just makes for a cleaner conversion and rack mounting. Home Brew - Kansas City Style ! We here at BYRG World Headquarters have been experimenting in taking some of our older analog only radios and using some behind the scenes "Sm0ke and Mirrors" secret sauce to make a very versatile DMR compatible digital radio repeater. MCS2000 900 Mhz Transmitter & Maxtrac 800Mhz Converted to 900 Mhz Receiver. and it has some ties to the Allstar Network too. Fusion, D-Star & P25, and soon NXDN and be allowed to be cross-connected to our existing analog network too! This is a work in process and no doubt be the way to go for the radios of the future. 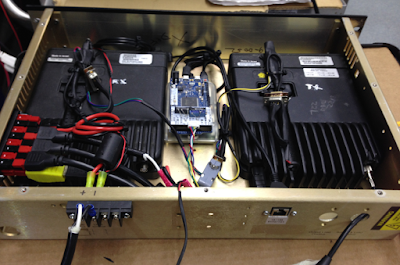 We will cover the 900 Mhz DMR project as I get it completed and tested at a later date. 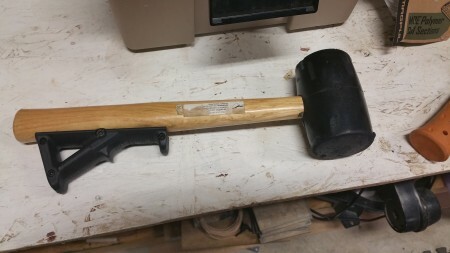 Currently, it is on the bench awaiting further connector interfacing. (For those who do not recognize the name Lucas, please know that in the earlier days of the auto, Lucas auto electrical components and systems we famous for their unreliability. 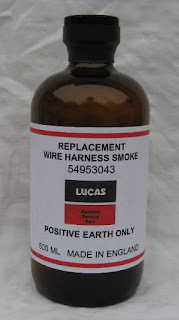 Positive ground depends on proper circuit functioning, which is the transmission of negative ions by retention of the visible spectral manifestation known as "smoke". 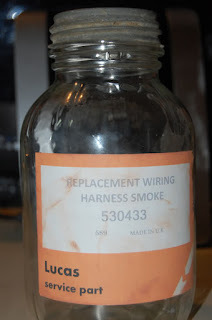 Smoke is the thing that makes electrical circuits work. We know this to be true because every time one lets the smoke out of an electrical circuit, it stops working. This can be verified repeatedly through empirical testing. For example, if one places a copper bar across the terminals of a battery, prodigious quantities of smoke are liberated and the battery shortly ceases to function. 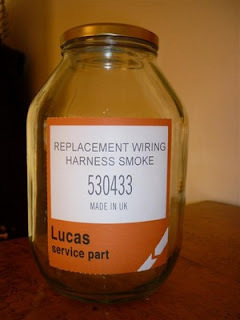 In addition, if one observes smoke escaping from an electrical component such as a Lucas voltage regulator, it will also be observed that the component no longer functions. The logic is elementary and inescapable! 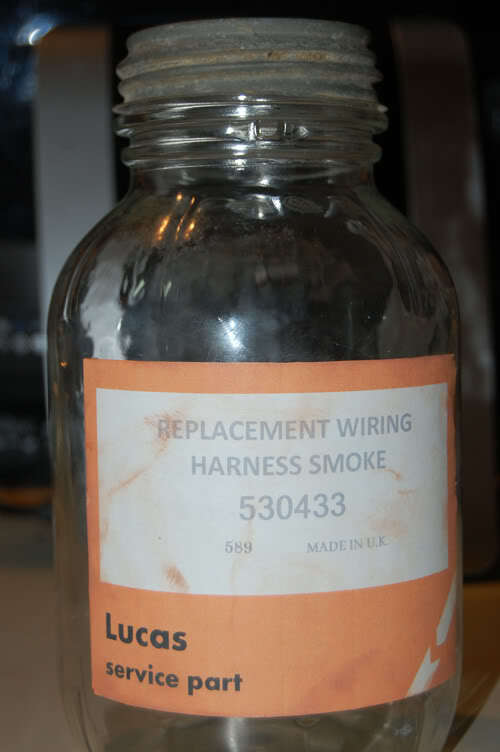 The function of the wiring harness is to conduct the smoke from one device to another. When the wiring springs a leak and lets all the smoke out of the system, nothing works afterward. Starter motors were considered unsuitable for British motorcycles for some time largely because they consumed large quantities of smoke, requiring very unsightly large wires. It has been reported that Lucas electrical components are possibly more prone to electrical leakage than their Bosch, Japanese or American counterparts. Experts point out that this is because Lucas is British, and all things British leak. British engines leak oil, British shock absorbers, hydraulic forks and disk brake systems leak fluid, British tires leak air and British Intelligence leaks national defense secrets. In conclusion, the basic concept of transmission of electrical energy in the form of smoke provides a logical explanation of the mysteries of electrical components especially British units manufactured by Joseph Lucas, Ltd. The Lucas motto: "Get home before dark"
The three-position Lucas switch--DIM, FLICKER and OFF. The other three switch settings--SMOKE, SMOLDER and IGNITE. Q: Why do the British drink warm beer? A: Because Lucas makes their refrigerators. What in the world is electricity and where does it go after it leaves the toaster? Here is a simple experiment that will teach you an important electrical lesson: On a cool dry day, scuff your feet along a carpet, then reach your hand into a friend's mouth and touch one of his dental fillings. Did you notice how your friend twitched violently and cried out in pain? This teaches one that electricity can be a very powerful force, but we must never use it to hurt others unless we need to learn an important lesson about electricity. It also illustrates how an electrical circuit works. When you scuffed your feet, you picked up batches of "electrons", which are very small objects that carpet manufacturers weave into carpet so that they will attract dirt. The electrons travel through your bloodstream and collect in your finger, where they form a spark that leaps to your friend's filling, then travel down to his feet and back into the carpet, thus completing a "round trip", since the total number of electrons in the carpet must remain constant. AMAZING ELECTRONIC FACT: If you scuffed your feet long enough without touching anything, you would build up so many electrons that your finger would explode! But this is nothing to worry about unless you have carpets throughout your house or place of employment. Although we modern persons tend to take our electric lights, radios, mixers, etc. for granted, hundreds of years ago people did not have any of these things, which is just as well because there was no place to plug them in. Then along came the first Electrical Pioneer, Benjamin Franklin, who flew a kite in a lightning storm and received a serious electrical shock. This proved that lightning was powered by the same force as carpets, but it also damaged Franklin's brain so severely that he started speaking only in incomprehensible maxims, such as, "A penny saved is a penny earned." Eventually he had to be given a job running the post office. After Franklin came a herd of Electrical Pioneers whose names have become part of our electrical terminology: Myron Volt, Mary Louise Amp, James Watt, Bob Transformer, etc. These pioneers conducted many important electrical experiments. Among them, Galvani discovered (this is the truth) that when he attached two different kinds of metal to the leg of a frog, an electrical current developed and the frog's leg kicked, even though it was no longer attached to the frog, which was dead anyway. Galvani's discovery led to enormous advances in the field of amphibian medicine. Today, skilled veterinary surgeons can take a frog that has been seriously injured or killed, implant pieces of metal in its muscles, and watch it hop back into the pond -- almost. But the greatest Electrical Pioneer of them all was Thomas Edison, who was a brilliant inventor despite the fact that he had little formal education and lived in New Jersey. Edison's first major invention in 1877 was the phonograph, which could soon be found in thousands of American homes, where it basically sat until 1923, when the record was invented. But Edison's greatest achievement came in 1879 when he invented the electric company. Edison's design was a brilliant adaptation of the simple electrical circuit: the electric company sends electricity through a wire to a customer, then immediately gets the electricity back through another wire, then (this is the brilliant part) sends it right back to the customer again. This means that an electric company can sell a customer the same batch of electricity thousands of times a day and never get caught, since very few customers take the time to examine their electricity closely. In fact, the last year any new electricity was generated was 1937. Today, thanks to men like Edison and Franklin, and frogs like Galvani's, we receive almost unlimited benefits from electricity. For example, in the past decade scientists have developed the laser, an electronic appliance so powerful that it can vaporize a bulldozer 2000 yards away, yet so precise that doctors can use it to perform delicate operations to the human eyeball, provided they remember to change the power setting from "Bulldozer" to "Eyeball." All very marvelous don't you think? 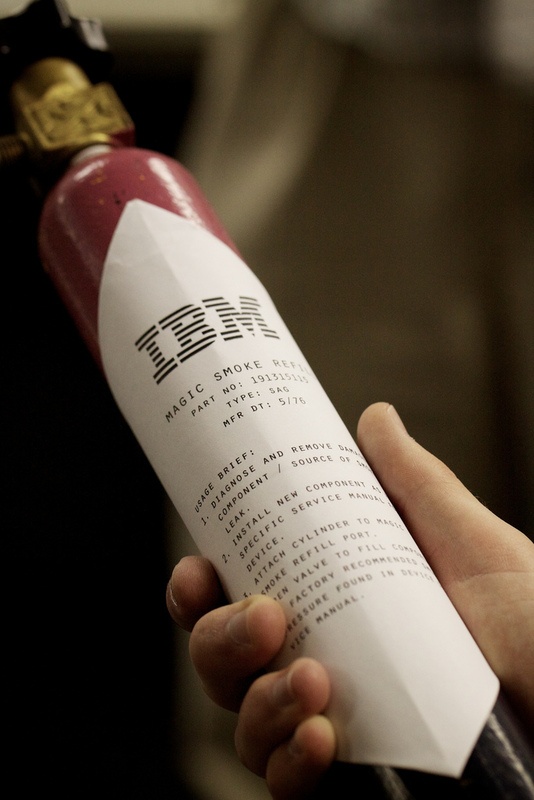 Now - I can vouch for the Smoke Theory. Two weekends ago my TV (A German Telefunken - doesn't always have to be Lucas) lost some of its smoke and stopped. While I was trying to plug that smoke leak with a screwdriver it sprung another bigger leak and lost a LOT MORE SMOKE and hasn't worked since. No shop I've been to can sell me any "Telefunken Smoke" that I can put back inside. 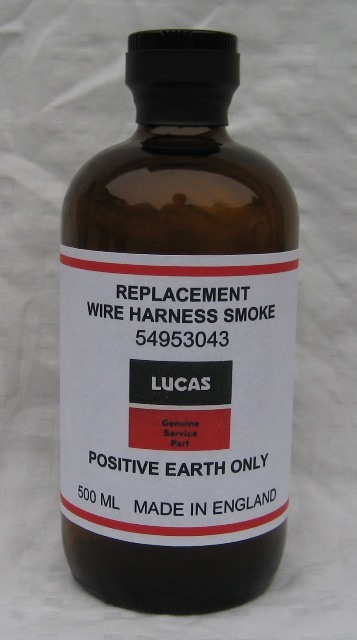 They all tell me that I need to buy parts with the smoke already sealed in, which cost a heap more than a bottle of smoke. Sort of like a sealed beam headlight. Sm0kenet.net. Awesome Inc. theme. Powered by Blogger.